Well now that I've done my in depth analysis of the new Chapter Tactics, I figured it was time to dive into the realm of the Space Marine named characters and discuss how they have changed since 5th edition. 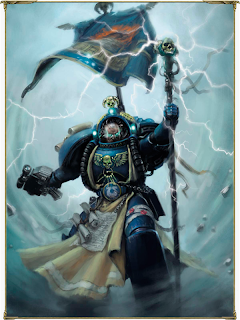 As there are a decent amount of special characters described in the book, I have decided to split my article into two parts: the first looking at the numerous Ultramarine characters and the second looking at the other characters. To give him his full title. Marneus had been a choice that many hobbyists avoided in the last edition of Warhammer 40k due to his huge points cost, which has gotten even bigger in the latest incarnation of the game (a whopping 275 points without the Armour of Antilochus!). So the real question on everyone's lips has been "is he worth taking now?" It's a hard one to judge. With the removal of the Combat Tactics special rule and the introduction of Warlord Traits and Chapter Tactics, Marneus no longer acts as an almost pure combat monster made to make mince meat of the opponent. Interestingly, his Titanic Might special rule no longer allows re-rolls to failed wounds making him slightly worse in combat (but still frightening) but his army wide buffs more than make up for this minor hick up in the translation between editions. As with the Ultramarines Chapter Tactics, Marneus allows for a massive amount of flexibility to the army. The first thing that struck me was the updated God of War special rule which not only still allows all marines in the detachment to choose whether or not to pass or fail morale checks, effectively being the only way you can get the old Combat Tactics rule, but also allows the army to use any one doctrine twice without having to declare which before hand. 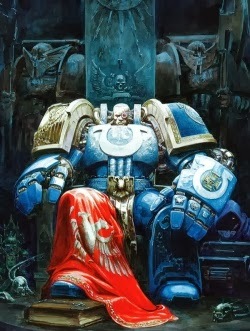 This rule alone allows the Ultramarines already high mastery of controlling their own tactics to go into overdrive. The second thing that struck me was Marneus's ability to roll three times on the Warlord Traits and choose amongst them which one he has, vastly reducing the chances of getting a duff trait and enhancing whatever suits your game the best. There really is no point in having Fear if against Tyranids afterall! The other changes are minor - +1 Attack and Wound (as with all Chapter Masters), Titanic Might now gives bonuses against vehicles and his Armour of Antilochus now allows Marneus to sweeping advance (! ), meaning the chances of players taking him alongside Honour Guard (of which he allows 3) more likely as they cut down all fleeing enemies in close combat with maniacal laughter. So even though he has a 275 point minimum price tag on his head, is he worth it now? My response is yes if only for all the buffs he grants his army. Sicarius has always been the Mini-Calgar of most Ultramarine armies. Where Marneus may have been too expensive to afford, all generals could rely on the Second Company Captain as a reliable (and relatively cheap) back up. As special characters go, Sicarius made the transition into 6th edition relatively unchanged apart from granting +1 to reserve rolls, losing his re-roll seize the initiative rolls and dropping 15 points. The main pull with Sicarius, however has been his ability to grant Counter-Attack, Infiltrate, Scout or Tank Hunters to a single Tactical Squad, effectively giving them a second Chapter Tactic. Alongside the Ultramarines Chapter Tactics, this can really widen the possibilities of what you can do on the battlefield. Give a squad Tank Hunter and then, once that main vehicle threat comes rolling over the hill, you can switch on the tactical doctrine and blast it into oblivion with las/melta/plasma/missile fire, or give them Infiltrator to claim an easy objective and switch on the devastator doctrine for a pure defense against aggressors. However, one overlooked quality of Sicarius is his effective synergy with other Ultramarine special characters. Along with Marneus (in bigger games), the pair of them will give you almost full control over your battle tactics, whilst coupled with Tigurius, his Surprise Attack rule can work amazingly with Tigurius's Gift of Prescience (see below). 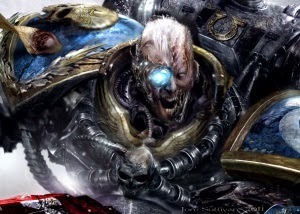 In any case, Cato Sicarius is a solid choice for any army, not only for the reasons above but because he's pretty hard (2+/4++ save with Feel No Pain), fairly nasty in combat and has a pretty useful Warlord Trait in The Imperium's Sword. I'm a passionate man and I will be honest, Tigurius's incarnations in 3rd, 4th and 5th edition made me nerd rage until I was blue in the face. Not only was he barely better than a bog standard Librarian (I would lose the extra psychic power for terminator armour any day) but he just costed an obscene amount of points, meaning I never even considered ever using him. Thankfully 6th edition came and made it all better, all for 65 points less. Tigurius is easily the most improved special character in the entire codex. He is the only Librarian in the whole codex who can pick from every psychic discipline in the codex, moreover he can re-roll all his rolls on the table and all his failed psychic tests, meaning he will almost never have any unwanted powers and will almost never fail to cast them which, with the randomness of the new psychic power rules in 6th edition, is invaluable to any commander, much less an Ultramarine player who will have a huge emphasis on precise tactics and carefully thought out plots. On top of this, his Gift of Prescience special rule allows you to re-roll any reserve rolls you wish, allowing almost full control of when your units arrive. Finally, the Rod of Tigurius has had a pretty major overhaul now granting +2 strength and gaining the Soul Blaze special rule, meaning the Chief Librarian no slouch in combat. 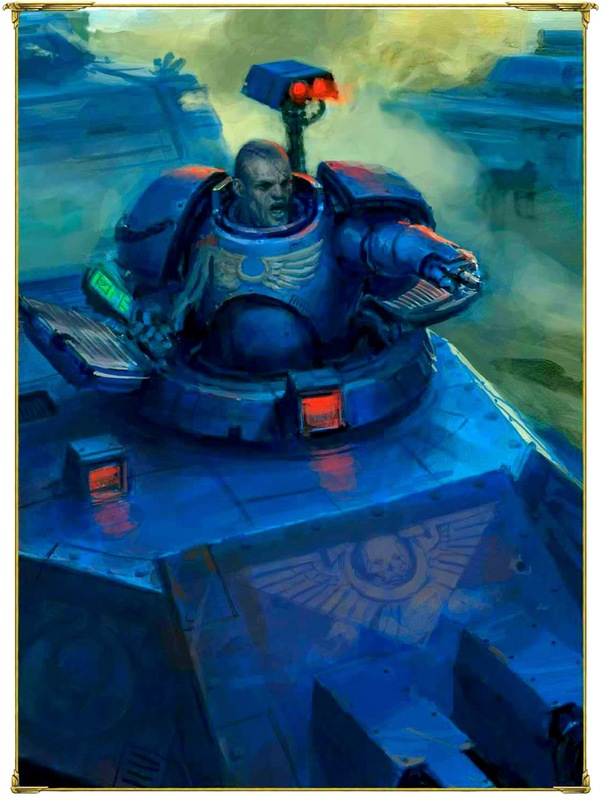 His Warlord Trait is Storm of Fire which can vastly improve an Ultramarine army's round of shooting for a single turn. All this makes Tigurius a very tempting choice for almost any game. Much like Sicarius, Cassius hasn't really changed all that much in 6th edition. He still has Feel No Pain, T6, Hatred and Fearless rules of 5th edition. Infernus does pretty much the same as before, except it is now S1 meaning you can no longer glance the rear of a Rhino with it, but that's not a big problem as no-one I know used it his bolter for that purpose anyway. The main change with Cassius is that he has regained his Preferred Enemy (Tyranids) special rule, something I was confused by the lack of in 5th edition. Unsurprisingly this can make Cassius a force to be reckoned with against Tyranids, and when coupled with Sternguard (effectively making up Tyrannic War Veterans) they can be next to unstoppable against that particular army. A full squad of Sternguard wounding on 2+, always re-rolling rolls of 1 on to-hit and to-wound means they will almost never fail to make it to the armour save phase of shooting. Even more frightening is if used against Tyranids that rely on cover saves, switch to Dragonfire rounds for almost gauranteed kills. Death Leaper, beware. Unlike the rest of the Ultramarine special characters, Telion is basically exactly as he was back in 5th edition, but by no means a bad thing. He is easily the best choice for Sargent in Scout Squads using sniper rifles. His marksman abilities can really way down enemy characters through pure weight of fire, and forfeiting his shooting to give a single scout BS6 can be more useful than it sounds (Heavy Bolter hitting on 2+, then 6+ if a 1 is rolled and then wounding on a 2+? I'll take that!). It's also worth noting that Camo Cloaks don't grant Stealth, but instead grant +1 cover save without affixing itself to the special rule, effectively giving Telion +2 cover save, making his normal scout armour redundant as long as he's behind cover. Stick him in a ruined building, you can ramp his cover save up to a very impressive 2+, making him just as, if not more effective than an Eldar Pathfinder. Wow! 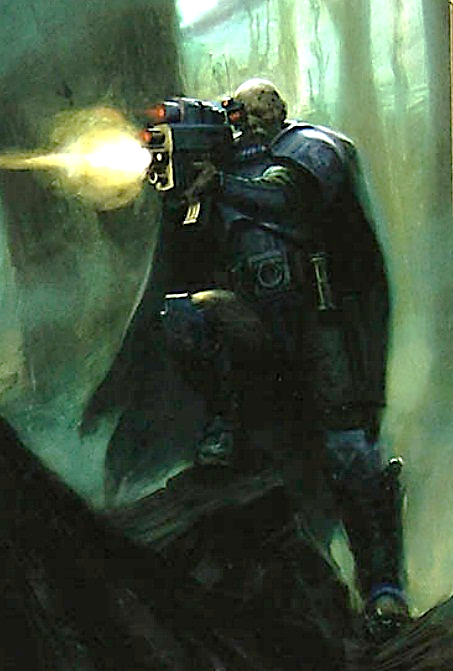 Probably the most overlooked Ultramarines special character and not without reason. It's hard to justify Chronus's existence in any army, and for his points cost you can almost buy a five man Scout Squad. It's not just that, but which tank do you put him in? Even with his ability to confer It Will Not Die to his tank, the introduction of hull points in 6th edition really doesn't make the whole idea seem particularly appealing as, if your opponent wants that tank dead, that tank will die, contrary to the special rule's name. His BS5 is pretty useless in a Vindicator, only minusing the scatter distance by a single inch and plenty of tanks nowadays are twin-linked. My only real conclusion is to place him in either a Stalker or a Hunter to maximise the tank's effectiveness against flying nuisances. The only fairly decent reason to have Chronus in any other tank is to prevent shaken/stunned results, and even then that's minor as those results are fairly rare nowadays. However, if that tank dies he can pop out and become... a lone marine with no special rules in a storm of gunfire, effectively making him completely useless except for a very desperate last stand with the intensity of a wasp sting against a tiger. All this considered, Chronus is the sort of character to take if you have a tank and 50 points you don't know what to do with. Otherwise, in most cases (apart from the whole AA thing I mentioned earlier) he is just a point sink.